A dispute since the British Raj, the Supreme Court will pronounce its verdict on the Cauvery issue on Friday. The 765-km-long Cauvery river originates in Kodagu district’s Talacauvery in Karnataka and flows through Haasan, Mandya, and Mysuru districts before entering Dharmapuri, Erode, Karur, Trichy, Cuddalore, Pudukottai, Nagapattinam, Thanjavur and other districts in Tamil Nadu. The river and its tributaries also flow through Kerala and Puducherry. The Cauvery water sharing dispute has been a bone of contention between Karnataka and Tamil Nadu since the time of the British Raj. Many of the districts in both states are dependent on the Cauvery for irrigation, while the city of Bengaluru gets its water from the river. In order to understand the long-standing issue, one has to go back to 1892. The Cauvery water sharing dispute began in this year between the Madras Presidency under the British Raj and the princely state of Mysore as the two regions could not agree over how to divide the water between themselves. In 1910, the two states began conceptualising the idea of constructing reservoirs to store the river water. As the two sides could not come to terms, the British presided over the issue of water sharing and in 1924, the Madras Presidency and Mysore state signed an agreement where the rules regarding the water usage of Krishna Raja Sagar (KRS) dam were listed out. The 1924 agreement gave Madras Presidency and the Mysore state the right to use surplus water from river Cauvery. Back then, the Madras presidency had objected to the construction of the KRS dam. However, when the agreement was signed, it gave Madras the freedom to construct the Mettur dam. As per the agreement in 1924, Tamil Nadu and Puducherry would get 75% of the surplus water, while Karnataka would get 23%. The remaining would go to Kerala. There were also restrictions on how much land could be irrigated. The issue of water sharing became a real problem after the re-organisation of the states in 1956. After the division of states, several protests have been witnessed in both Tamil Nadu and Karnataka, which has sometimes escalated into violence. Through the late 20th century, Tamil Nadu was opposed to the construction of dams on the river by Karnataka. Karnataka’s argument was that the 50-year time period for the 1924 agreement had ended in 1974, and hence the state was not obliged to stick to the regulations, especially since the river originated in the state. This became a problem for Tamil Nadu as the state had become dependent on Cauvery water especially huge area of agricultural land in the delta area. Between 1960 and late 1980s, Karnataka built four dams on Cauvery – Hemavati, Harangi, Kabini and Suvarnavathy. Tamil Nadu, the lower riparian state, argued that this put them in a precarious situation and approached the Supreme Court. Karnataka argued that the river water sharing should follow international norms (divide the water in equal proportions). The Karnataka government had suggested that the two states could obtain 47% of the water each and the rest could be supplied equally between Kerala and Puducherry. Tamil Nadu was not happy about this and wanted to stick to the 1924 agreement. In the year 1986, the farmer's association in Tamil Nadu’s Thanjavur area moved the Supreme Court demanding that a tribunal be formed for sorting out the water sharing dispute. In 1990, the apex court heard the petitions submitted by both the states and directed them to negotiate. When dialogue failed, the SC directed the Centre to form a tribunal which would decide on the distribution of water between the two states. The Cauvery Water Disputes Tribunal (CWDT) then calculated the water inflow to Tamil Nadu between 1980 and 1990. In 1991, the tribunal in its interim order directed Karnataka to ensure that 205 tmcft of water reach Tamil Nadu per annum. The CWDT also ordered Karnataka to stop its plan to increase irrigated land area. The tribunal’s decision was not received well and riots erupted in both the states. Karnataka rejected the tribunal’s award and sought for an annulment in the Supreme Court. The SC struck down the state’s ordinance attempting to nullify the award and went on to uphold the tribunal’s order. In 1993, Tamil Nadu Chief Minister Jayalalithaa went on a hunger strike at MGR memorial in Chennai stating that the tribunal’s interim order was not being followed. Karnataka said that the state was facing drought and hence could not release water. In 1998, the Cauvery River Authority (CRA) was formed and was tasked with implementing the interim order of the CWDT. The CRA comprised of the Prime Minister as the Chairperson and the Chief Ministers of the four states as its members. 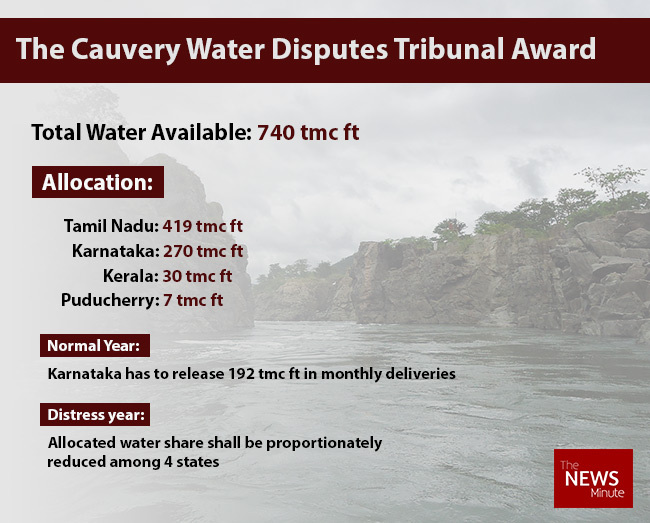 After a lot of to-and-fro in the issue, the Cauvery Water Disputes Tribunal gave out its final award in 2007. In a normal year, the CWDT ordered that Karnataka has to release to Tamil Nadu 192 tmcft (as against 205 tmcft in the interim award) in monthly deliveries at the interstate border, Billingundlu. This comprises 182 tmcft from the allocated share of Tamil Nadu, including 10 tmcft for environmental purposes. In a distress year, the tribunal order stated that the allocated shares shall be proportionately reduced among Kerala, Karnataka, Tamil Nadu and Puducherry. The lack of clarity on the sharing of water during a distress year is one of the reasons for the dispute. In 2013, the central government notified the final award. The then Chief Minister of Tamil Nadu, Jayalalithaa approached the SC for the formation of the Cauvery Management Board, which did not bear fruition. Since then, on many occasions, the two states have sparred over the sharing of water with Karnataka arguing that on years with scanty rainfall, it would not be able to release water to Tamil Nadu. In September 2017, the Supreme Court reserved its judgement on the appeals filed by the states against the CWDT’s final award. Tamil Nadu had argued that the court should not leave the dispute open for Karnataka to take advantage of and should appoint the authority and frame a scheme for the allocation of water. On Friday, the apex court will deliver its verdict on the centuries-old dispute.